Skin tightening can be a way to achieve a younger look quickly without surgery. The procedure uses technology that heats the skin stimulating collagen and elastin to improve skin texture and smoothness. Are You a Candidate for a Skin Tightening Treatment? You could be a candidate for skin tightening if you have loose skin that doesn’t respond to diet or exercise. Treatment of lax abdominal skin can be part of a nonsurgical Mommy-makeover. Crepey skin of the arms and knee areas are a common complaint as we age. When you schedule your consultation, Dr. Elizabeth and her staff will go over the procedure in detail, assess your goals, and help you determine if this procedure is right for you. 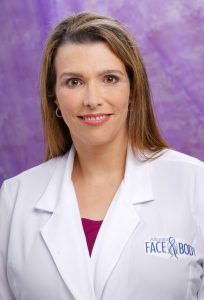 Dr. Elizabeth Whitaker, of Atlanta Face & Body in Vinings, Georgia, makes it a priority to provide the best in a naturally pain-free experience. Schedule a Private Consultation today to learn more about how Skin Tightening can help you attain your very most Beautifully You. During the procedure, targeted technology is used to heat the skin’s underlying layers. This stimulates the formation of collagen and causes the skin to tighten. A topical anesthetic may used to reduce discomfort depending on the technology used. The procedure is usually completed in less than an hour. Because the procedure is non-surgical, recovery time is quick. Most people can resume most activities immediately after the procedure. You’ll see progressive results over the weeks after the treatment. Multiple treatments may be recommended to achieve the optimum results.